For the past five years, the Boston Consulting Group has compiled and published an e-intensity index. The data for 2013 were published in December and South Korea again leads the world, ahead of a group of Scandinavian countries and the U.K. 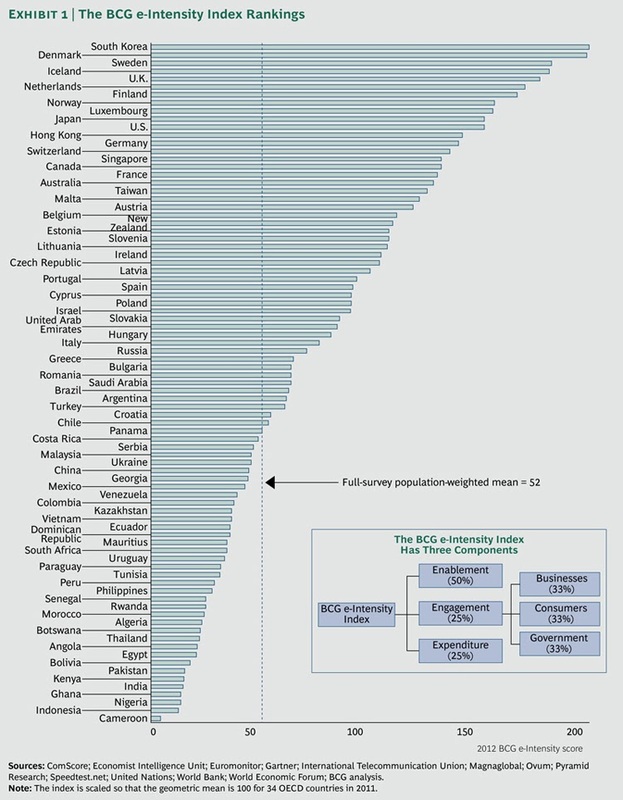 The 2013 BCG e-intensity index can be accessed here. Note that registration and a login is required to use the interactive graphic. The bar graph published with this post (click to see a full size version of the graphic) accompanied the 2012 E-intensity index. The 2012 BCG report contained the following interesting observation. "Back in 1997, the White House also put forth five principles that described how governments should approach Internet policy. The first and most important was that “the private sector should lead.” This has been borne out by time. The Internet has enjoyed widespread adoption in countries with vibrant private sectors that allow the inventions of Apple, Google, Orkut, Rakuten, Spotify, and their kin to thrive. But if we examine the e-Intensity Index leaders, a more complex—and interesting—story emerges. (See Exhibit 1.) Many of the most advanced digital economies—South Korea, Sweden, and Japan, for example, three of the top ten 2012 e-Intensity Index nations—have developed coherent, long-term strategies for going digital." The e-intensity index measures the relative maturity of Internet economies on the basis of three factors: enablement, engagement, and expenditure. Enablement accounts for 50 percent of the total weighting and measures various aspects of fixed and mobile infrastructure deployment. Engagement, 25 percent, measures how actively businesses, governments, and consumers are embracing the Internet. Expenditure, 25 percent, measures the proportion of money spent on online retail and advertising.